How much does it cost to travel to Melbourne? How much money will you need in Melbourne? AU$160 ($115) is the average daily price for traveling in Melbourne. The average price of food for one day is AU$34 ($24). The average price of a hotel for a couple is AU$186 ($133). Additional pricing is in the table below. These average travel prices have been collected from other travelers to help you plan your own travel budget. How much money do I need for Melbourne? Melbourne is the second largest city in Australia, after Sydney. It is also the capital city of the state of Victoria, in southeastern Australia. Melbourne is arguably the best city to experience culture and the arts in Australia. There is a friendly rivalry between Melbourne and Sydney over livability and popularity and Melbourne is definitely the city to visit for its parks, shopping, restaurants, galleries and theaters. Like Sydney, it is situated on the water, at the head of Port Phillip Bay. It's a beautiful city, and although it lacks the major sights that you'll find in Sydney such as the Sydney Opera House or the Harbour Bridge, you will never find yourself lacking for entertainment. It is also a wonderful base for exploring many of the nearby highlights, including Grampians National Park, The Great Ocean Road, and Phillip Island where you can view the penguin parade. Melbourne has a temperate oceanic climate. Because the city sits on the boundary between very hot inland areas and the cool southern ocean it is prone to abrupt and unpredictable changes in weather conditions. This is most common in the spring and summer months when cold fronts can form that cause gales or severe thunderstorms and hail storms. Temperatures in the summer months can climb to 35 or 40 degrees Celsius. Winters are cool with temperatures around 14 degrees. Melbourne has countless attractions for visitors. Many entertainment options are found in the city center. Some of the most popular include Flinders Street Railway Station, Eureka Tower, the Parliament House of Victoria, Queen Victoria Market, the State Library, Southgate, Federation Square, the Old Melbourne Gaol, the Yarra, and the Shrine of Remembrance. There are many historical sights in Carlton and the Melbourne Zoo is in Parkville. For beachside nightlife head to St. Kilda. Melbourne's City Center has the central business district and the historical core of the city. The cosmopolitan Docklands area is also included here. The area is very energetic with a great nightlife and restaurant scene. Southbank is a good area to visit for entertainment, fine dining, river trips. St. Kilda has many beaches and restaurants. 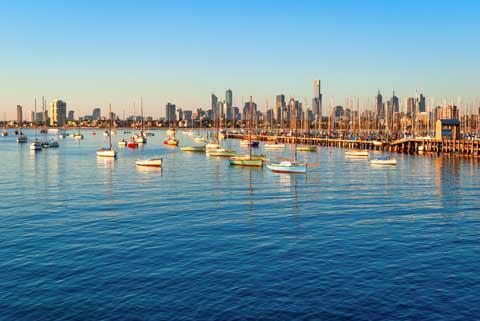 South Melbourne is where you'll find Port Melbourne and Albert Park. Inner North has Carlton, Parkville, and North Melbourne, and Inner East has Fitzroy, Richmond, and Collingwood. Stonnington has Toorak, Prahran, and South Yarra. There are many cultural and outdoor activities to enjoy around Melbourne. There is interesting street art around town that you can explore. There is also a great live music scene as well as many sporting events and shows you can go to. Food in Melbourne is very diverse, international, and somewhat expensive. The service is usually quite good and a ten percent tip is the norm. If you receive excellent service then a higher tip is always appreciated, and if you are unhappy with the service you receive, this can also be reflected in your tip. Restaurant options are plentiful and you'll find some of the more touristy options in the Carlton area. Southbank and Victoria Street also have many options. In the Richmond area you'll find the most budget friendly options including Vietnamese and Southeast Asian restaurants. If you're looking for Middle Eastern food head to Sydney Road in Brunswick and Coburg. Although Melbourne is quite large, you'll find most of the sights in close proximity to each other within the city center. There is no need to rent a car while visiting Melbourne as there is a successful public transit system known at Metlink. Metlink includes trams, trains and buses that will likely get you anywhere you need in the city with little hassle. If you're planning to be in Melbourne for less than five days, purchase day passes which are about $7 to stay within Zone 1. Do keep in mind that on weekends single ticket fares are cheaper and it may not be worth purchasing a full day ticket. Evaluate ahead of time before you commit. Suburban trains leave from Flinders Street Station and many go through the City Loop connecting to Southern Cross Station. Trains are frequent but can be crowded during peak hours. Melbourne has one of the largest tram networks in the world. It goes through much of the inner and middle suburbs. There's a free City Circle tram that goes through the central business district and Docklands area. Buses fill in where trains and trams don't go. They typically travel to major shopping areas in the middle and outer suburbs.